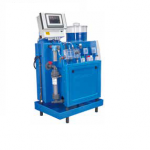 The Chlorydos 10 Complete is a dosing station for calcium hypochlorite, acid and flocculant, complete with automatic control system measuring free chlorine, pH-value, redox and temperature. Available through Pollet Pool Group, the Chlorydos 10 is the ultimate combined control and feeder system ideal for pools up to 1,100m3. The user-friendly touchscreen display indicates current data and the unit has web visualisation by smartphone, tablet or PC. Easy to install, the Chlorydos 10 is suitable for commercial and domestic applications and comes with a two-year warranty.